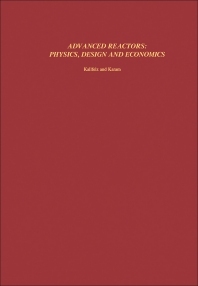 Advanced Reactors: Physics, Design and Economics contains the proceedings of the International Conference held at Atlanta, Georgia on September 8-11, 1974. Organized according to the sessions of the conference, this book first describes the national programs for the development of advanced reactors. Subsequent sessions centers on economics of advanced reactors; developments in reactor theory; advanced reactor experiments and analysis; cross section data and calculational methods. The last three sessions focus on sensitivity analysis of integral reactor parameters; problems in the design of advanced reactors; and the design and operational experience for advanced reactors. 3. Fast Reactor Cross-Section Processing Codes - Is There a Dollars Worth of Difference between Them?